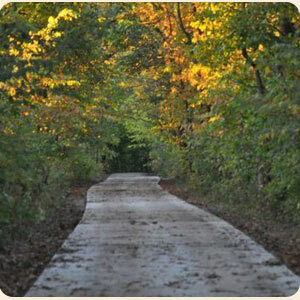 The TREC county-wide trail project would not be possible without the financial support of local government entities, state agencies, and private citizens. Whether it be a large grant from the state or a membership fee from a local citizen, TREC is thankful for the support it receives, regardless of the amount of a donation, because each and every dollar counts when building and expanding the trail system. Every foot counts when building a trail! Show your support and build a foot, or two, of the trail through the Foot of the Trail program. As a Foot of the Trail participant, you will be proud to know you have ownership in this community project. You also will be recognized for your support of the project and receive membership benefits, including trail updates and invitations to all TREC events. Benches located along the trail and can be named as you choose. Past donor’s choices have included recognizing a business, showing support from a family, or honoring the memory of a loved one. The naming opportunities for a bench are $10,000 each. All benches are sold out at this time. Benches may be available for future projects. Naming opportunities are available for your family or business to express support for this county-wide project and show you have invested in the future of our community. As part of the 2012 Campaign, several naming opportunites are available. To learn more about available opportunities, Click here or contact a member of the Fundraising Committee. Trails Recreation Effingham County (TREC) is a 501(C)3.